A shipwreck containing 200 tonnes of silver worth £150m has been discovered in the Atlantic - the largest haul of precious metal ever found at sea. 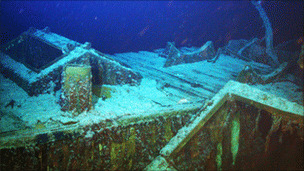 The SS Gairsoppa, a UK cargo ship sunk by a German U-boat in 1941, was found by US exploration firm Odyssey Marine. The firm will retain 80% of the cargo's value under the terms of a contract with the Department for Transport. Only one person from the 85-strong crew survived the torpedo attack as the ageing steamer tried to reach Ireland. The vessel was on its way back to Britain from India when it ran low on fuel in stormy weather, and tried to divert to Galway harbour, but it was spotted and sunk by the German submarine. 'Robotic submarines' Three members of the crew survived in a lifeboat and reached the Cornish coast two weeks later, but two died trying to get ashore. The wreck of the 412ft ship was found this summer nearly 4,700m below the North Atlantic, 300 miles off the Irish coast, but it was only confirmed as SS Gairsoppa last week. Odyssey Marine's senior project manager, Andrew Craig, said: "We've accomplished the first phase of this project - the location and identification of the target shipwreck. "Now we're hard at work planning for the recovery phase. "Given the orientation and condition of the shipwreck, we are extremely confident that our planned salvage operation will be well suited for the recovery of this silver cargo." SS Gairsoppa settled upright on the seabed with its cargo holds open, which means remote-controlled robotic submarines should be able to retrieve the bullion. The marine archaeology and exploration company said it was "highly unlikely" any human remains would be found, given the age and depth of the wreck. Odyssey's chief marine archaeologist Neil Dobson said: "Even though records indicate that the lifeboats were launched before the ship sank, sadly most of her crew did not survive the long journey to shore. "By finding this shipwreck and telling the story of its loss, we pay tribute to the brave merchant sailors who lost their lives." The merchant ship belonged to the British India Steam Navigation Company, and was ordered into the merchant navy fleet at the outbreak of World War II. A Department for Transport spokeswoman said: "The contract for the salvage of the SS Gairsoppa was awarded by competitive tender in accordance with government and departmental procedures. "While we do not comment on the specifics of such commercial arrangements, Odyssey Marine Exploration were awarded the contract as they offered the best rate of return to HMG."